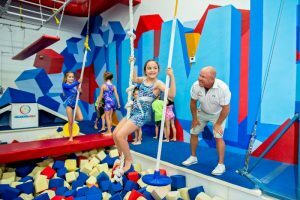 We offer Kids’ Day Out open gym play for kids 3 to 13 years old in the Little Gym and the Big Gym. Kids’ Day Outs are held on designated days in the summer. We open up the gyms and provide staff supervision while you run a few errands. It’s a great time for the kids to come practice their skills or just hang out with friends and get in some fun exercise. Non-members are welcome at KDO, so bring a friend for double the fun!